Fresno, California is located in the PDT (Pacific Daylight Time) time zone, UTC/GMT -7 hours. The sunrise is at 07:05 and the sunset at 18:23 for the moment of the mid-October 2018. The length of the day is 11 hours 18 minutes. Greenwich, UK is 8 hours ahead of Fresno, California. 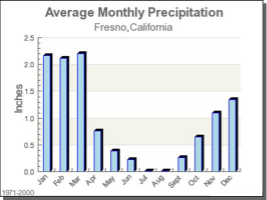 Fresno is located in the area of the semi-arid climate, that is characterized by mild winters and hot, dry summers. That type of climate explains the low level of precipitation, however, which is still higher than at the areas with the desert type of climate. December and January are the coldest months of the year with the average temperature of 8.1 °C or 46.5 °F. There are about 14 nights annually when the temperature goes below freezing, the coldest temperature, however, might reach −1.1 °C or 30 °F. July is the hottest month of the year with the average temperature of 28.3 °C or 83.0 °F. There are about 32 days annually when the temperature reaches 37.8 °C or 100.0 °F or even more, and 106 days when the temperature reaches 32.2 °C or 90.0 °F. Meanwhile, in July and August, the temperature reaches not more than 32.2 °C or 90.0 °F not more than 3-4 days. 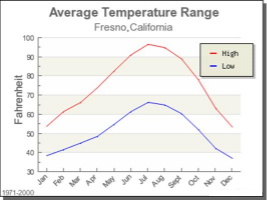 The highest temperature in Fresno was recorded July 8, 1905, when the temperature reached 46.1 °C or 115 °F. The lowest temperature was filed on January 6, 1913, when it fell to −8 °C or 17 °F. In the period from June 1 to September 15, the temperature is most likely to exceed 37.8 °C or 100 °F. Meanwhile, the period from December 10 to January 15, is most likely to have the freezing temperature. Summers provide a considerable amount of sunshine, July, meanwhile, is the month with the majority amount of sun. However, January is the month with the lowest amount of the sunshine due to the tule fog, which is characterized for that particular region. The average annual level of the sunlight equals around 81% of possible sun, that is also 3550 hours of sun. The average level of precipitation is 292.1 millimeters annually, that describes the climate of the area as a semidesert. The years of 1982 and 1983 that are considered the ‘rain year,' the precipitation level reached 598.7 millimeters. Meanwhile, the driest years of 1933 and 1934, had the precipitation level of only 112.5 millimeters. There are around 48 days annually on average. Snowfall is rare for that area, the highest level of snow was recorded on January 21, 1962, when it reached only 0.06 millimeters.